Governing Council 13 / AFBiS Seminar. 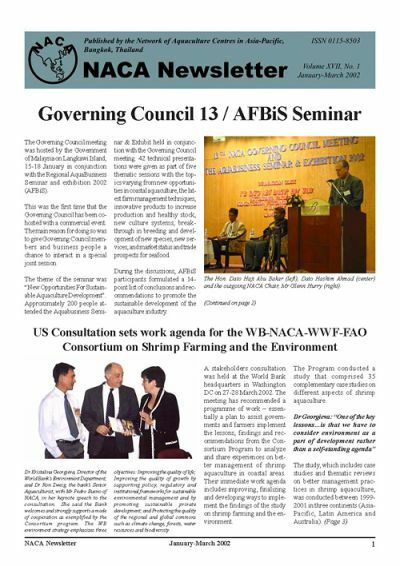 US Consultation sets work agenda for the WB-NACA-WWF-FAO. Consortium on Shrimp Farming and the Environment. 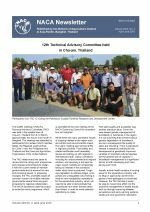 Conclusions and Recommendations of the Joint meeting of AFBiS 2002 and the 13th NACA Governing Council. FAO/NACA Expert Consultation Focusing on Aquaculture and Small-scale Aquatic Resource Management for Poverty Alleviation. Myanmar Fishery and Livestock Fair 2002 a huge success. Nepal develops national strategy on aquatic animal health management. Shrimp Farming & the Environment Case Studies now available on the web. NACA implements APEC project on Import Risk Analysis. MOU on project to prevent disease losses on prawn farms. Andhra Pradesh Fisheries Minister studies Thai & Malaysian aquaculture systems. Vietnamese mission evaluates new high value Chinese species.